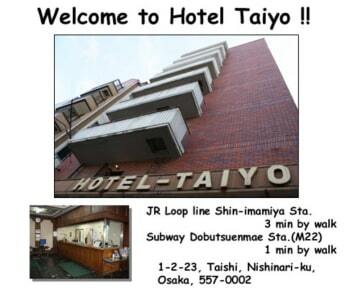 Thank you for considering Hotel Taiyo for your stay! We aim to provide comfortable, convenient and affordable accommodation in Osaka at a price that can\'t be beat. Hotel Taiyo is definitely one of the best places to stay, right in the heart of Osaka, designed for the active traveler whose focus is experiencing a lot of things during holiday. 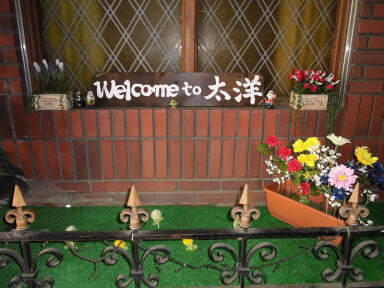 It is a perfect location, excellent transport links will take you anywhere in Osaka quickly and easily. Only a minute walk from Subway Dobutsuenmae station on Midosuji line, which will drop you off at Namba, Umeda, Shin-Osaka and Tennoji station, and a 3 minute walk to JR Shinimamiya station. If you want to have a JR pass for your exploration, you will sure take full advantage of. In this area you can find Tsutenkaku Tower (a symbolic tower with an observation deck), Spa World (an onsen theme park with full of water facilities), Shitennoji Temple (the first and oldest Buddhist temple in Japan), Den Den Town (an enormous shopping district jam-packed with electronics and computer equipment), Osaka Municipal Museum of Art, Tennoji Park, Tennoji Zoo and more attractions all within walking distance. Namba is only 2 stops away, so you will have easy access to the best shopping, restaurant and nightlife spots as well. Want to see more historical sites? 24-hour reception to help answer all your question as best as possible to help your stay enjoyable. Chat with our staff, which is always willing to help with Osaka insider advice on what to see and how to get around. Osaka has a longstanding reputation as \'the kitchen of Japan,\' for having the best food in Japan. Okonomiyaki, Takoyaki and Kushikatsu restaurants are all in walking distance. -Private shower rooms are 24hours available. 2 hotel computers to use for your convenience for FREE will help with keeping in touch with friends and family, looking for work or planning the rest of your trip. You may arrive earlier and leave your luggage at the hotel if your room is not ready for you. Luggage storage facilities after check out are also available. It is an old building and not very pretty but it was very nice to stay there. There is everything you need and it's very close to Namba. Staff is very nice and helpful. We had a private room in Japanese style, my sister slept very good but I didn't :( beds are quite hard and it was cold in February. Besides, you hear quite a lot what your neighbour does... But I'm very satisfied with my stay here!